Soup dumplings, ramen, pizza and a tiki bar headline some of the big openings in the area. Navy Strength opens this Thursday, March 30, in Belltown. The ambitious tiki bar comes from the same owners behind No Anchor, which was a semifinalist for “Best New Restaurant” from the James Beard Foundation last month. During the soft opening earlier this week, its sous-vide pork belly, served with curry rice or as a sandwich, was the big hit. Iconiq in Mount Baker is one of the most promising restaurants to debut in Seattle so far this year, a French-Japanese fusion bistro from Toshiyuki Kawai, who worked at the Book Bindery, Harvest Vine and Luc. One standout was his Japanese rendition of clam chowder with miso and soy milk, thickened with cream cheese, rounded out with some smokiness and brininess from bacon and manila clams. Iconiq sits in the former space of the French restaurant A La Bonne Franquette. Contadino and Pizzeria Contadino are open on Capitol Hill, focusing on pasta and Neopolitan-style pizza. Brunch was recently added at the former. Nelson Whitmore from Pizzeria Delfina in San Francisco oversees both places. The restaurants are owned by Brian Clevenger, who also runs the underrated Vendemmia and East Anchor in Madrona and Raccolto in West Seattle. Henry’s Taiwan Bistro sits off the barhopping drag of Queen Anne, serving noodles and Taiwanese dim sum, though its soup dumplings are too doughy to rank among the city’s best. Poke mania: Newport Poke opens Friday, March 31, across from Seattle University, one of like a zillion that have popped up around Seattle and on the Eastside recently. See an exhaustive list of poke openings and the reason why they’re popular here. Qian Noodle opens off Aurora Avenue North, focusing on Chinese pork, lamb and chicken soup. On the Pike/Pine corridor, The Capitol Lounge replaces the Lobby Bar; The Dane, a beer bar and coffee cafe, opens in Crown Hill, while The Saloon from the same folks behind the nearby The Feed Store opens in Mount Baker. Tavern 12, a sports bar, opens inside the Residence Inn in the U-District, with 32 local beers on tap and 28 televisions to catch the Final Four. A side note on the bar scene: The Ballard Smoke Shop closed its doors on Wednesday for only the third time in the last 45 years to throw a retirement party for bartender Marsha Erickson, who has worked at this popular dive bar for more than 40 years. Din Tai Fung finally opens in downtown Seattle, and guess what? There’s not always a line. 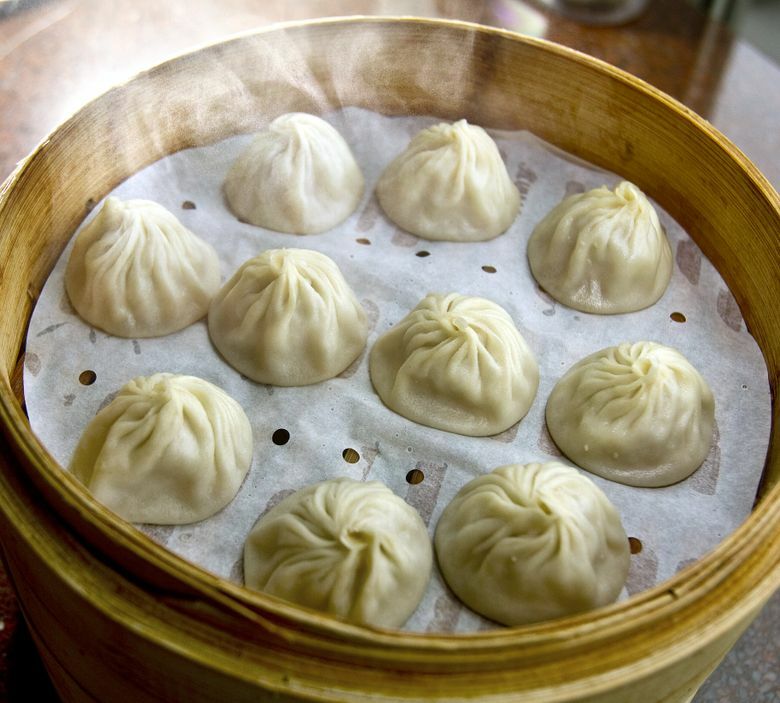 Within two months, this Taiwanese-soup-dumpling chain will also expand to Southcenter mall, which already has another Taiwanese import, 85°C Bakery Café, which does have lines. Long lines. And joining them soon at Southcenter will be the Taiwanese hot-pot chain Boiling Point. Olive Tree in Kent expands with another Mediterranean restaurant on Capitol Hill, near Smith. Shawn O’Donnell’s Restaurant and Irish Pub opens its third location in Fremont, after plopping down in Everett and in the Smith Tower in Seattle. Rita’s Italian Ice, a national chain, opens in Kent. Pressed Juicery expands in Bellevue and on Capitol Hill, after opening on Queen Anne and downtown Seattle. Lady Yum, the macaron place in Kirkland, lands in Seattle-Tacoma International Airport, according to Eater. Ok, not happening yet, but we couldn’t wait. Salt & Straw, the much loved ice cream joint in Portland is coming to Capitol Hill in late summer, according to Seattle Met. Henderson, under Huxley Wallace Collective, has been one of the most aggressive restaurateurs, opening ambitious projects in up-and-coming neighborhoods, where other chefs say the clienteles aren’t there yet. Vestal is located next to another Henderson project, Cantine, which was Cantine Market, which sold sandwiches. That didn’t go too well, so now it’s back to focusing on craft beer. Henderson also recently opened KiKi Ramen to replace Bar Noroeste, an ambitious Mexican-inspired joint in Denny Triangle that never found its footing. Outlier replaces Sazerac inside Hotel Monaco Seattle and focuses on small plates and an eclectic entree lineup (pierogies with braised pork sugo and rockfish bo ssam). The Runaway on the Pike/Pine corridor replaces Moe Bar, a spruced-up den with food service coming from Paseo next door and craft cocktails from unheralded bartender Veronika Groth. The Runaway sits next to Neumo’s, which also got a face-lift with the back floor raised so that late arrivals can see the stage from the back. Televisions were also added on the second floor. Tu Cantinas replaces Ground Control, hawking tacos next to the much-loved Brass Tacks in Georgetown. Bell and Whete is now Belltown Brewing, with burgers, pasta and pizzas and its own line of beers.